The arena containing the four ice sheets that will be used at the 2009 Worlds and next year's Olympics and Paralympics, will seat 6,00 spectators when finished. As you can see by the photo there is still a lot of construction work yet to be done. 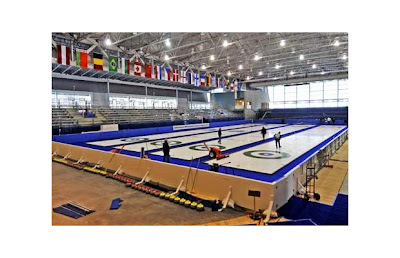 The ice is being put in by renowned ice-makers Hans Wurthrich and Dave Merklinger and will be looked after during the Worlds by Peter Luk from Switzerland and Jorgen Larsen from Denmark, who prepared ice in Torino and at the World Championship last year in Sursee.